Hosting your little one’s annual celebration can be a big deal, especially when you consider that he or she has not had a lot of experience with birthday parties; this means that he or she simply does not know how epic their party can be! As the parent, it falls on you to organize and accomplish every task on your checklist to ensure that the big day is one full of exciting adventures and wonderful memories. From the party invites to the theme, it can be hard to get everything lined up for a great time. Funtastic Playtorium is proud to be your go-to indoor playground in Washington, delivering the perfect kid’s party place for adventures, parties, and more. Anyone in need of kids’ birthday party ideas in Bellevue can benefit from visiting our indoor play places on Factoria and Alderwood. Our indoor playground provides the perfect place for children aged 1-10 to run amok and let loose! Regardless of your little one’s age, the demands for planning a quality birthday bash can be intense. Today, we’ll look at a few major components that should be covered in advance to ensure an amazing event for guests and parents. When ready, be sure to contact our kids’ birthday party playground to see how we can take your fiesta to the next level! From Star Wars to the Little Mermaid, the theme of the party will provide a focus for how your event should be enjoyed. Once your little star is old enough to decide on his or her favorite show, movie, or character, chances are that he or she will adamantly supply you with what type of party to throw. Today’s electronics provide a new wave of speed and convenience for all of us, yet the party invitation remains the same. This printed or handmade letter should be sent out three or four weeks prior to the party, allowing parents to make plans that aren’t too soon to balance or too far out to worry about. The Funtastic Playtorium team can help! We provide the paper invitations and guidance needed to help you inform everyone and ensure that they make it to the big event. Stocking up on supplies weeks in advance will help to ensure that you have everything you need while providing ample time in case a particular item is backordered or out of stock. You’ll have time to plan ahead, so be sure to include all of the streamers, flags, and hats needed to create a full theme for the little ones. Finding a place in advance will help to make or break your child’s birthday party. 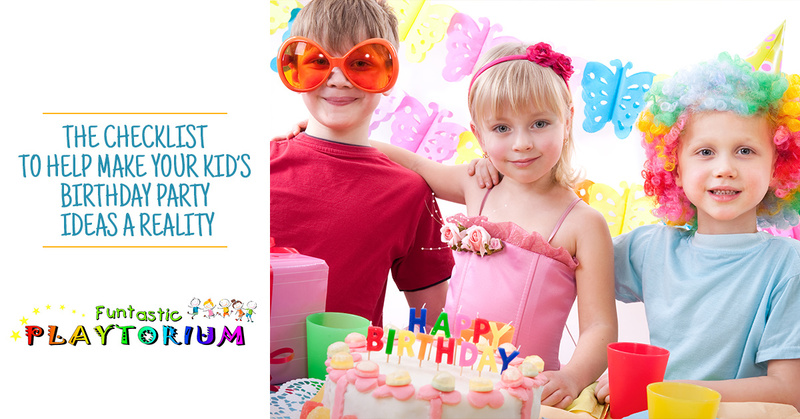 It is essential to find a location well in advance to secure your kid’s birthday party venue. We recommend calling six to eight weeks ahead to schedule your party. Funtastic Playtorium happens to be one of the best indoor playgrounds in Bellevue, hosting parties that allow children of all ages to run around and play. Our safe and secure venues are ideal for hosting a party, so be sure to call ahead to see when we can plan your child’s big day! Anyone in need of venues and kid’s birthday party ideas in Bellevue can find everything they need at our indoor playground. Contact us today to see how we can help take your child’s birthday party to the next level!